American Chad Campbell has a one-shot lead over countrymen Jim Furyk and Hunter Mahan after launching the best opening birdie salvo seen at the tournament. Campbell hit five birdies over the opening five holes to leap up the leaderboard and looked on target to equal or better the course record of 65 — nine under par — before bogeying the final two holes. His opening run was one better than Ken Venturi’s four-birdie start in 1956. 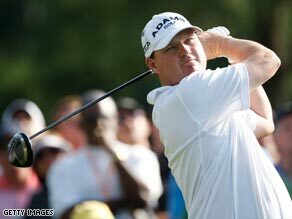 “I was pretty excited,” Campbell told PGATOUR.com “You can’t get too excited after five holes; you have a lot of golf left. I was trying to hit good golf shots to try to give myself as many opportunities as I could.” Mahan thought Campbell would get to 10 under easily. “For sure, when you see 8s and 9s go up there, that’s going to get your attention. That’s the great thing, you still feel like a fan sometimes watching the leader boards; at least Thursday, you do. It was neat to see. It’s neat to see red numbers like that out here,” he told the Web site. Mahan, himself, at one stage grabbed a share of the lead only to fall back with a double bogey at the 11th and a bogey on the 18th. “I felt like I was swinging great coming in,” said Mahan. Meanwhile Tiger Woods, the world No.1, failed to take advantage of the conditions, posting a 2-under 70, to lay 20th, five shots off Campbell. Woods, however, was sanguine. “It’s not like I haven’t been in this position before,” Woods told PGATOUR.COM. “I didn’t make any birdies until 9, so it was nice to kind of turn where there was some kind of momentum going into the back nine,” Woods said. “Everyone was making birdies everywhere on that back nine, so I knew it could be had with good shots.” Woods, a four-times champion at Augusta, has only had the lead once in the first or second round in any of his previous 14 previous starts at the Masters. Elsewhere Larry Mize, who beat Greg Norman in their famous play-off to win the tournament in 1987, turned back the clock to hit 67 and be two strokes off the lead. The 51-year-old said he loved Augusta. “I just think my first thought is just we are older, but we are still competitors … and we love this place,” Mize told PGATOUR.com Last year’s winner, Padraig Harrington, finished two shots further back with a 69.